As is known to all, conventional solids control equipment, such as vibrating screen, desander, desilter and centrifuge can separate 2-5 micron particles, the tiny particles, it is difficult to by a simple mechanical separation method. But with the ongoing of drilling, ultrafine particles accumulate if, in the mud circulating system, drilling have a big impact in the long run. Drilling contractors have to drilling fluid to reach the purpose of drilling using is being continuously diluted.This creates more waste of water resources, and produce more drilling waste.GN SOLIDS CONTROL can GN1500 series 20 feet box type flocculent dosing system into a 20 foot container after decorating the room, easy operation and transportation. Through this system can dewatering centrifuge with champions league, and elevating bracket and for slurry pump, can meet the requirements of customers overall solutions. Crown can GN1500 series 20 feet box type flocculent dosing system is mainly chemical flocculant automatic configuration, used for auxiliary dehydration centrifuge separation of water-base drilling mud tiny particles, so as to get clean water for industrial use. By using GN1500 series 20 feet box type flocculent dosing system with crown to high-speed frequency conversion centrifuges, can separate ultrafine particles in water base drilling mud, to meet the requirements of the recycled water. 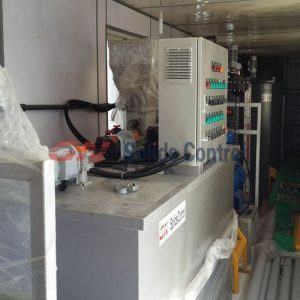 For mud does not be born the circulatory system, flocculation and dewatering system is particularly important, it can help keep clean mud drilling company, and can reduce the drilling waste. To reduce the overall operating costs. For the heavy mud, first through mechanical centrifuge separation, recovery of heavy metal and stone, and then into the dosing flocculation centrifuge separation system. You Sir/Madam are the enemy of confusion evrerwheey!